Dharna programme started throughout the country, demanding the rolling back of the Subsidiary Tower Company. 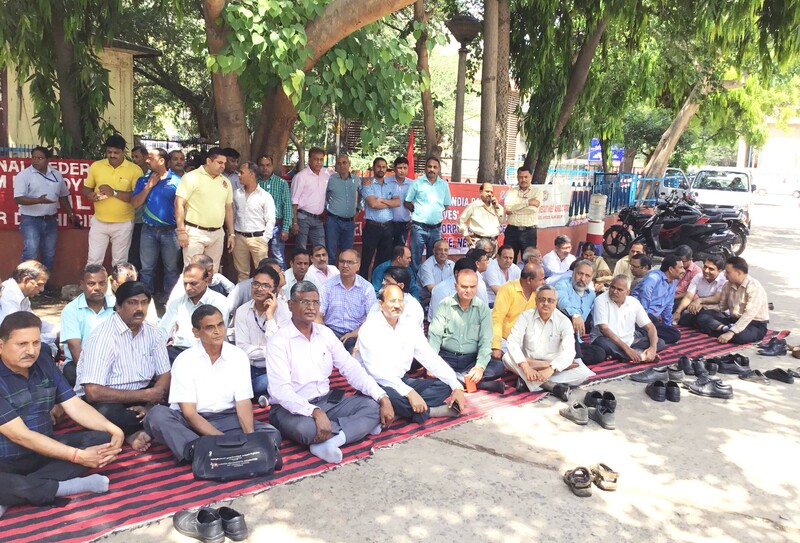 As per the call of the All Unions and Associations of BSNL, dharna programme is being conducted throughout the country, demanding the rolling back of the Subsidiary Tower Company. At Corporate Office, dharna programme is organised at the Eastern Court. Report is coming from various circles, about the successful conducting of the programme. Sending note on wasteful expenditures - CEC members to note please. The CEC meeting, held at Agartala, has decided to give a detailed note to the Management, on curtailing of wasteful expenditures. It is also decided that, all Circle Secretaries and Central Office-bearers should give their suggestions in this regard to the CHQ. Those CEC members who have not sent the note to the CHQ so far, are requested to immediately send the same. Within a day or two, CHQ will be submitting this note to the Management. Organise tomorrow's dharna programme very effectively. The AUAB is conducting dharna programme throughout the country, demanding the rolling back of the Subsidiary Tower Company. The CHQ of BSNLEU has already called on the circle and the district unions of BSNLEU to take the initiative to conduct the programme very effectively. Serious mobilisations among the public, against the Subsidiary Tower Company will certainly create compulsions on the government. Hence, all units of BSNLEU are requested to conduct this programme very effectively tomorrow. CITU brings out the souvenir in connection with the inauguration of Com. P. Ramamurti Bhawan, at New Delhi. Copies of the souvenir are being despatched to the circle unions which have given the advertisements. 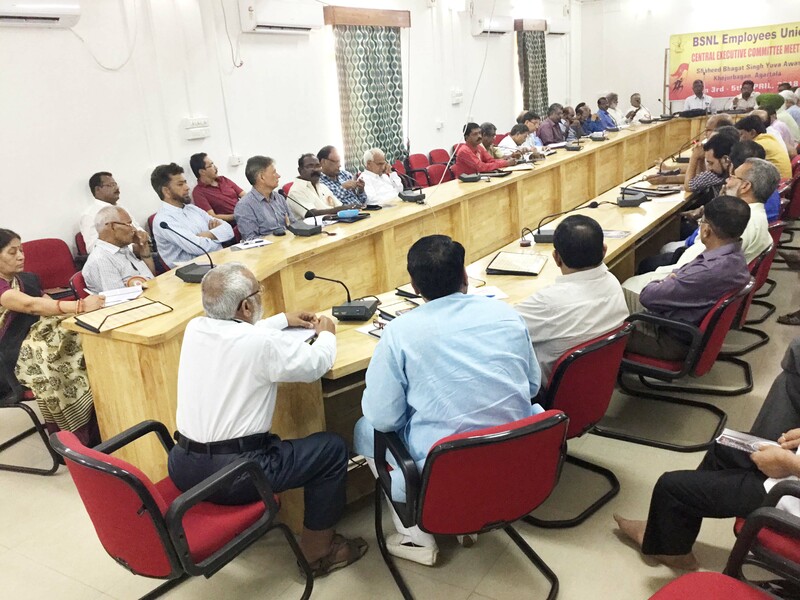 Views of the Ernakulam Convention of the Central Public Sector Trade Unions. The Ernakulam Convention of the Central Public Sector Trade Unions held on 08-04-2018, has drawn the road-map for struggles against privatisation and on the wage revision issue. Following are the views of the Convention. Declaration of the Ernakulam Convention of the Central Public Sector Trade Unions held on 08.04.2018. We have already intimidated about the postponement of the National Council meeting, scheduled to be held on 16-04-2018. The Corporate Office has issued letter for the postponement. Central Public Sector Trade Unions (CPSTUs) decides to intensify struggles against privatisation and to settle wage revision. To conduct a nationwide campaign programme in all the Public Sector undertakings. To send Fax to the Prime Minister and Minister of Heavy Industries. To conduct a National Convention on 25th May, at New Delhi, against privatisation, Fixed Term Employment and on wage revision issue. Massively organise dharnas on 12-04-2018, demanding the rolling back of the Subsidiary Tower Company. Compelling the government to roll back the Subsidiary Tower Company is the priority task of the trade union movement of BSNL. To achieve this, the All Unions and Associations of BSNL has called on the BSNL employees to organise massive dharnas throughout the country on 12-04-2018. CHQ calls upon the circle and district unions to coordinate with the other constituents of the AUAB, and to mobilise maximum number of Non-Executives and Executives in the dharnas. Observe Dr.B.R.Ambedkar Jayanti on 14-04-2018. Architect of the Indian Constitution, as well as a great social crusader, Dr.B.R.Ambedkar’s birth anniversary falls on 14th April, 2018. This day is already being observed by our comrades in many parts of the country. 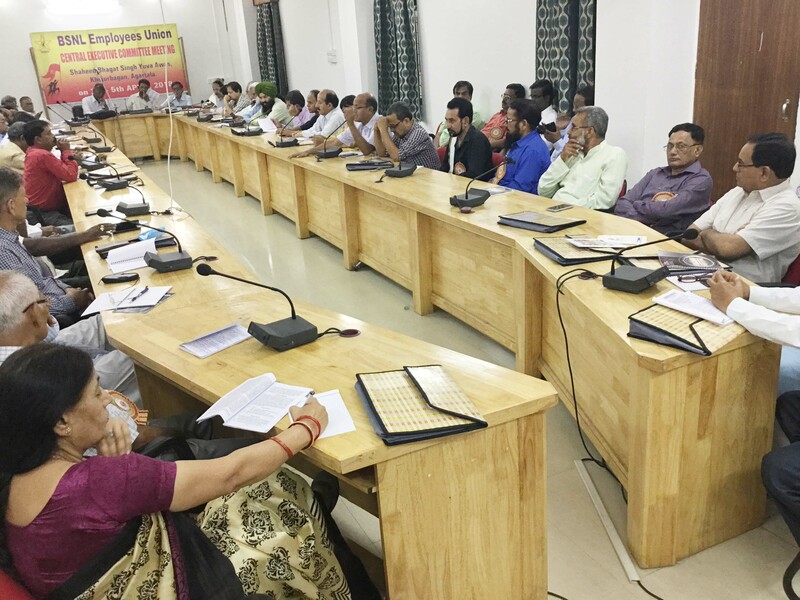 The CEC meeting of BSNLEU, held at Agartala recently, has called upon all the circle and district branches to observe this year’s Dr.B.R.Ambedkar Jayanti in a befitting manner. The occasion should be utilised to high light Dr.B.R.Ambedkar’s contributions to the nation and also the need to uphold the secular character of our nation. Reports and photos may be sent by email to the CHQ. National Council meeting is getting postponed. The 36th meeting of the National Council has been scheduled to be held on 16.04.2018. Notification for this meeting has already been issued. Recently, we have informed that Com.Chandeswar Singh, GS, NFTE, lost his elder brother. On account of this, he has informed the Management that he was not in a position to attend the meeting on 16.04.2018. In view of this, the meeting is getting postponed. Agartala CEC meeting decides to conduct demonstrations, wearing black badges on 03.05.2018. Conduct fresh recruitment in the cadre of Sr.TOA. All circle and district unions are requested to take all out efforts to conduct the programme effectively. Com.P.Abhimanyu, GS, addresses the 16th All India Conference of the AISGEF. The 16th All India Conference of the All India State Government Employees Federation (AISGEF) is being held at Chennai since yesterday. Com.P.Abhimanyu, GS, has been invited to address the Inaugural Session of this Conference yesterday. Since the General Secretary was in the CEC meeting of BSNLEU yesterday, he greeted the AISGEF Conference today. The General Secretary called on the State Government employees to join shoulder to shoulder with the working class of India, to fight against the pro-rich policies of the government, and also to strengthen communal harmony in the country. Decisions taken in the CEC meeting of BSNLEU, held at Agartala, from 3rd to 5th April, 2018. The CEC meeting of BSNLEU, held at Agartala, has made serious deliberations on various important issues, and has taken decisions. All the Circle and District Unions are requested to implement these decisions, within the time frame, as set by the CEC meeting. CEC meeting of BSNLEU came to a successful conclusion. The three day CEC meeting of BSNLEU, being held at Agartala, came to a successful conclusion today. The meeting carried out elaborate discussion on all the crucial issues being faced by BSNL and it’s employees. In addition, a mid-term review of all the decisions taken in the last All India Conference, as well as in the Tiruvananthapuram and New Delhi CEC meetings was done. At the end of the three day discussions, Com.P.Abhimanyu, GS, summed up the discussions. The meeting has taken various important decisions, which will be updated on the website soon. CEC meeting of BSNLEU continues for the second day. The CEC meeting of BSNLEU is continuing in Agartala for the second day today. CEC members are deliberating on the report on activities submitted by the General Secretary. The next All India Conference of BSNLEU is to be held at Mysuru, Karnataka. 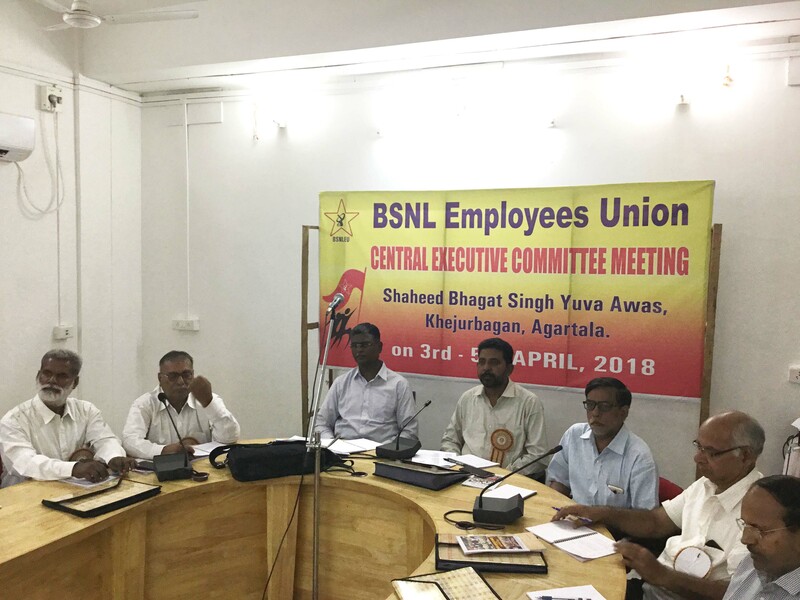 In today’s CEC meeting at Agartala, Com.C.K.Gundanna, circle secretary, Karnataka, offered to host the next All India Conference of BSNLEU at Mysuru. The house unanimously accepted the proposal of the Karnataka circle union. The CEC meeting also unanimously resolved that the next All India Conference shall be held in the month of February, 2019. CHQ heartily congratulates the Karnataka circle union for their proposal. The three day CEC meeting of BSNLEU started enthusiastically at Agartala. The three day Central Executive Committee meeting of BSNLEU started at Agartala, the capital of Tripura, today. The NE1 circle union and the Tripura district union have made excellent arrangements for the meeting. The meeting started with Flag hoisting. The National Flag was hoisted by Com.Balbir Singh, President. The Union Red Flag was hoisted by Com.P.Abhimanyu, GS. Floral tributes were paid in the martyr’s column. A brief, but impressive cultural programme marked the beginning of the CEC meeting. Com.Balbir Singh, President, is presiding over. Com.Mitun Ranjan Bhowmik,Chairman, Reception Committee, welcomed everyone. Com.P.Abhimanyu,GS, welcomed everyone, on behalf of the CHQ, and briefly spoke on the importance of the CEC meeting. Com.K.Hemalata, President, CITU, delivered the inaugural address and spoke elaborately on the anti-worker and pro-rich policies of the government. She praised BSNLEU for it’s role in the fight against the anti-BSNL policies of the government. Com.V.A.N Namboodiri, founder General Secretary of BSNLEU spoke and greeted the meeting. Shri Ashish Pathak, GM, Tripura also greeted the meeting. Finally, Com.Shankar Bhardan, Joint General Secretary of the Reception Committee, proposed vote of thanks. After the lunch break, Com.P.Abhimanyu, GS, presented the report on activities. Thereafter, deliberation by CEC members started and is going on. 3 day CEC meeting of BSNLEU starts at Agartala tomorrow. The 3 day CEC meeting of BSNLEU starts at Agartala tomorrow. The meeting is being inaugurated by Com.K.Hemalata, President, CITU. Wage Revision, fight against the Subsidiary Tower Company issues will be key issues to be discussed in this CEC meeting. Besides, the meeting will also make a mid-term review of the functioning of the Union. Venue of the CEC meeting is Shaheed Bhagat Singh Yuva Awas, Kehjurbagan, Agartala.